(SPOILERS) Just two entries in, and a running flaw has already established itself in Legendary Pictures’ bid for a “MonsterVerse” cinematic universe: exemplary visuals (delivered by talented directors) and laudable design work married to borderline non-existent characterisation. For the humans, at any rate. Is this an endemic problem with such movies, that the massive, monstrous protagonists inevitably dwarf their human counterparts? I don’t know. 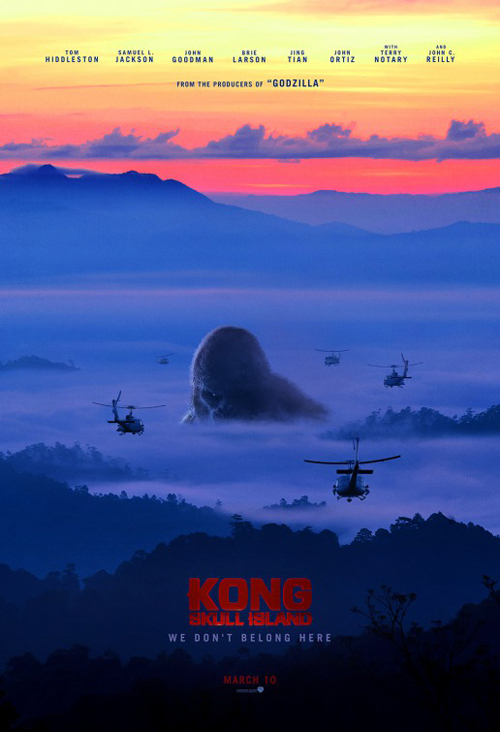 At least Kong himself fares better in Kong: Skull Island than most over-sized feature creatures, mainly because he isn’t over-used and is mostly well-used when he is. But Jordan Vogt-Roberts’ movie generally seems uncertain over how to integrate its ingredients, from overblown Nam motifs to puerile anti-war sentiments to wacky comic relief. Skull Island occasionally put me in mind of the considerably slenderer budgeted but considerably more imaginative 1975 adaptation of Edgar Rice Burroughs’ The Land That Time Forgot. 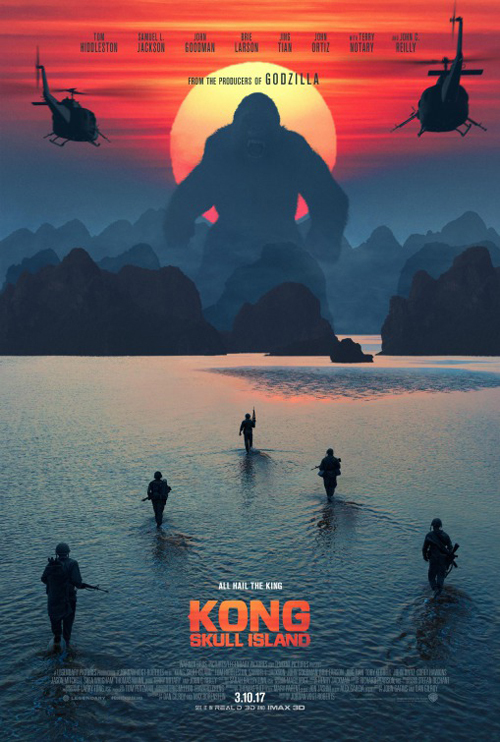 Like Kevin Connor’s flick, Kong takes place during a period of warfare long enough past to have entered the realm of the mythic (60 years for Land, 45 for Skull Island), where the iconography of its fictional representations have become irrevocably entwined with the reality. Both take place almost entirely on strange and isolated islands populated by freaky creatures and feature uneasy alliances between differently, sometimes dubiously, motivated groups. But, while Land offers mysteries and secrets to solve, Skull Island is an open book. There’s nothing up the sleeve of the screenplay credited to Dan Gilroy (Nightcrawler), Max Borenstein (Godzilla) and Derek Connolly (presumably employed because he co-wrote Jurassic World’s less-than-original-but-made-a-lot-of-dough screenplay). Maybe it’s John Gatin’s fault, since he provided the storyline and also furnished us with dreck like Real Steel and Need for Speed. Or perhaps it’s the old story of writers hard-pressed to juggle the demands of studio execs? 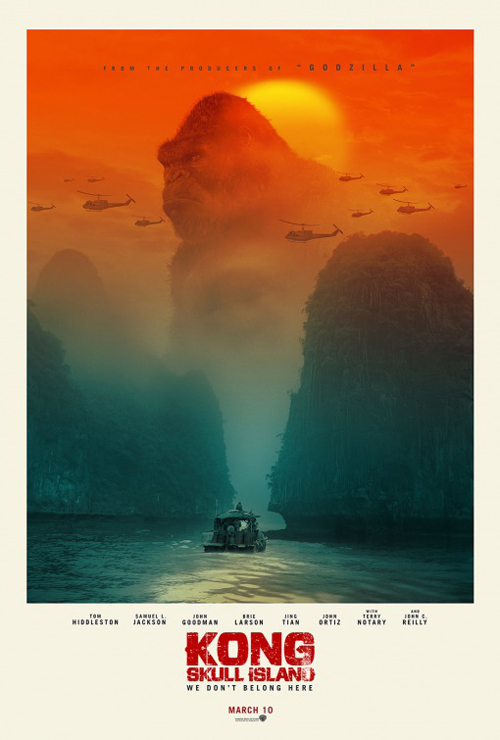 Either way, beyond the admittedly arresting conceit of the period, which has already been stretched a very long way with its Kong meets Apocalypse Now advertising, there’s too much here that seems like a missed opportunity. 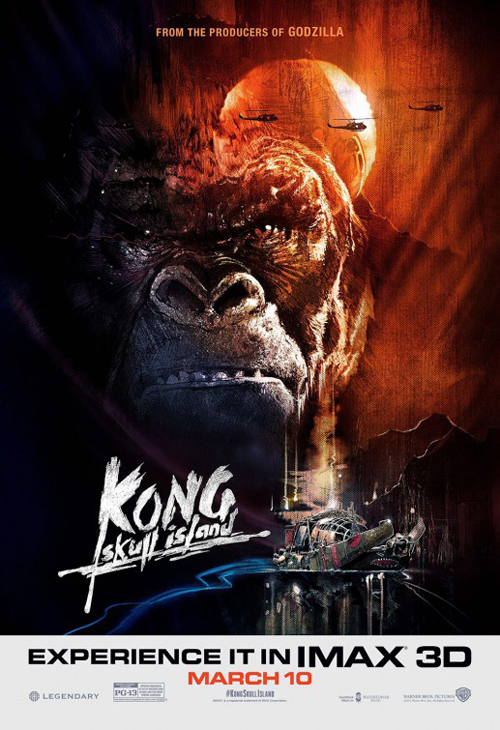 Kong’s so preoccupied with staking its franchise claim that director Jordan Voight-Roberts fails to ensure it is authentically pulpy, in the immersive way the best of these sorts of pictures are (see Raiders of the Lost Ark for the prime example). Instead, he mashes up genres and tropes and wonders why they don’t stick better. John C Reilly and Samuel L Jackson are in completely different movies, you’re never remotely convinced Tom Hiddleston is really hanging out in ‘70s Nam, and the island, for all that it includes some wonderful vignettes (the giant spider!) and stunning vistas, fails to evoke a truly uncanny environment. There are stirrings of something more intriguing with John Goodman’s Bill Randa, promoting the always-appealing Hollow Earth theory (not that we get to see it – just one of those missed opportunities) and the lore of MUTOs, former dominant life forms on the planet, all set to regain control of the Earth, something that has been an enduring touchstone in one shape of form (Doctor Who’s The Silurians providing one period-appropriate example). There’s also his tale of surviving a monstrous encounter as a young sailor (something that might have been a more evocative means of starting the picture, as well as a direct link to Godzilla) And, being the ‘70s, the setup wouldn’t be complete without the lure of conspiracy, as seen in the government agency Randa works for, one with a – really obvious to the audience -– secret agenda. Oddly (or is it? ), it’s called Monarch, which is also the name of the (purported) CIA mind control programme of that era. So, there’s more than enough potential, but while Vogt-Roberts brings a turbo-charged, stylistic tour de force to much of the imagery and action, there’s only ever lip service to era, be it the references to Nixon, the war is hell of Nam or the liberal dousing of period pop tunes (regardless of how prolific they’d actually be in ’73), so literal they have White Rabbit playing in the bar where Hiddleston’s ex-SAS Captain James Conrad is found (Hiddleston’s performance is professional and serviceable, but outside of the occasional deadpan “How lovely” in response to some new nastiness, he feels miscast. He also has zero chemistry with Larson). The maxim of any action movie worth its salt ought to be, “If you don’t care about the characters, you aren’t going to care about the spectacle”, no matter how expensive that spectacle. It’s this that’s far more damaging to Skull Island than the straight in-straight out linearity of the narrative (there’s no time to explore the island, with its set deadline; even Land, half an hour shorter, managed to get to grips with the mechanics of its microcosm; there’s a tribe in Skull Island but they’re resolutely silent, which I don’t know if it’s a stroke of genius or a complete cop out). The deaths are meaningless. Even Reilly’s comic relief doesn’t feel indispensable (Reilly’s funny, but the producers bafflingly believe we care so much about his WWII survivor Hank Marlow that we’ll be invested in his credits roll family reunion; it would be neither here nor there if he’d been offed by a skullcrawler). In this regard, the demise of Goodman’s Randa, who actually had something interesting going on, is more of a loss. Crucially, I cared more for the giant stick insect Toby Kebell starts shooting at, which has all of a minute of screen time, than any of the humans. The grunts are clearly designed to supply the broad strokes impact of the units in Aliens or Predator but entirely fail to do so. Kebbell makes an appearance in a non-motion captured role for a change, but his CGI counterparts confound his intentions (he does get one of the best lines, though: “Is that a monkey?”) Shea Whigham manages to exert some presence and at least goes out in a manner that made wonder for a moment if Vogt-Roberts was taking the piss out of such heroic last stand moments (his self-detonation is so completely off target, but it doesn’t play as a laugh, yet feels like it should) and was a minimalist commentary on the efficacy of the US war machine. But then I just as quickly concluded that such an interrogation was probably a waste of time. Generally, the attempts at commentary in the picture happily fit the description banal. Jackson has more impact, of course, since the 2-D villainy of Colonel Preston Packard, bent on winning at all costs, having “abandoned” Nam (the “It was a draw” line having long since been taken by A Fish Called Wanda) allows him engage in some patented bellowing and ranting. He’s not very interesting, basically, so hissable that he may as well be a Disney villain, and falling into the same category we recently saw in Logan, where the bad guys can’t compete with the hero. Who’s Kong, obviously, and who is surprisingly one of the better elements of the picture. I say surprisingly, as I’ve never found the character remotely interesting (I’m one of those who was always more fascinated by the dinosaurs of the original, before they happened across the great ape). His primal protector role, “King” of the island (given Legendary can’t actually call him King Kong directly, they’re amusingly cheeky about getting as close as they possibly can), is much more effective than the enormous simian chubby he develops for a tiny human female in each previous new iteration. Even given he’s bigger than before, and going to get even bigger for his upcoming grand slam tournament, the choice doesn’t detract from the action. 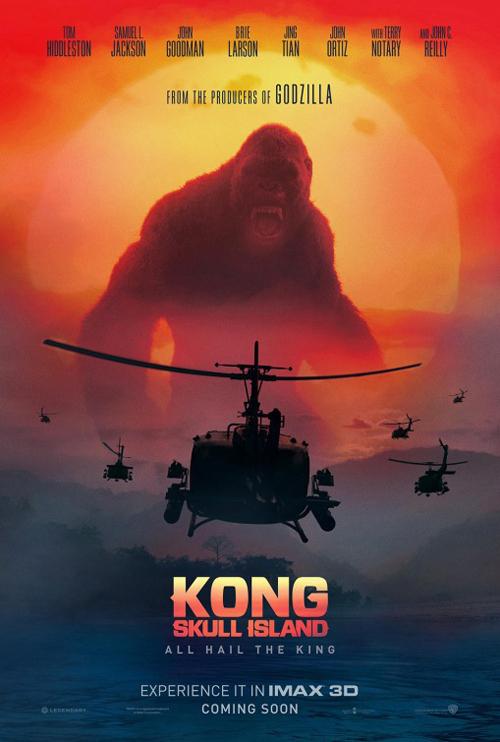 Vogt-Roberts has clearly put a lot of thought into how to use Kong in each sequence, from the teaser that wisely dispenses with the whole origins business (albeit, that’s actually ma or pa Kong) and goes straight to the reveal, to the decisive takedown of military firepower as he swats helicopters away like flies. Later he wrestles (and makes sushi of) a giant squid-like thing and does some impressive WWF moves on the daddy of all skullcrushers before extracting its innards via its tongue (all these sequences needed were some Looney Tunes sound effects to sell how funny they might have been). If avoiding the Kong/Ann Darrow romance angle is a plus, no one on board has stepped up to the plate of making Brie Larson’s Mason Weaver even remotely plausible. She’s a war photographer who’d make James Woods and Jon Savage in Salvador spit blood, particularly when she breathlessly announces “I’ve photographed enough war zones in my time to know a mass grave when I see one”. And that’s only the start. Mason struggles futilely to save a giant deer, which endears her to Kong. She instructs Packard not to shoot Conrad, whom he is all set to… and he doesn’t. Why? Go figure. She must just have that special something. You could say it isn’t Larson’s fault, but she did take the bloody part (and the sizeable pay cheque). The last time such a graceless plummet befell a Best Actress Oscar winner, Halle Berry followed Monster’s Ball with Die Another Day and Catwoman. Weaver is, at least, an effective snapshot of all the issues with the picture; how exactly does a war photographer get on board a classified mission? Why do all her pictures look like they’ve been passed through a Photoshop Elements filter? She even goes around announcing she’s an “anti-war photographer”, before waging war on a skullcrusher with a flare pistol (there’s no reason for her to be an expert shot with it, other than this we are now two decades into post-Buffy Hollywood and such lazy empowerment is assumed (even her character name is irritatingly indolent, as if summoning Ripley’s ghost is all that’s necessary). Vogt-Roberts also includes more than enough cheesy moments to make the argument he hasn’t much idea of what he’s doing (Larson charging in out of nowhere, lobbing an explosive cigarette lighter; Hiddleston, in a gasmask, brandishing a samurai sword, rollicking to the rescue), because they’re played straight rather than with an eye to how inane they are, by pretty actors unable to inhabit the sendup they need to work. He also tries to riff on the patriotic fallen heroes vibe (complete with mournful Henry Jackman score) that worked in Predator – kind of – but flails badly. And yet, there’s still more than enough in the way of sheer panache. Cinematographer Larry Fong, on day release from Zach Snyder’s juvenile paws, is able to revert to the kind of scenic canopy that made his work on Lost so lush. Early scenes flow confidently and fulfil their potential, including the assembling of the team, the encounter with and fly through of the wall of fog, all the while a Nixon bobblehead informing the mission, and a dragonfly foregrounded as helicopters drop bombs. Indeed, the picture only really begins to own up to its shortage of ideas once Kong has downed everyone. And even then, Vogt-Roberts continues to devise set pieces like an artier exponent of a Jerry Bruckheimer movie (his use of slow motion is a delight). Easily my favourite moment in Skull Island comes during the helicopter destruction derby, as one of the humans plunges towards Kong’s open jaws. Vogt-Roberts cuts away to a close-up of character biting into a sandwich. It’s the sort of thing Joe Dante would have embraced, if he’d had his hands on a blockbuster of this ilk, and suggests its director nurses an appealing, blackly comic streak. Likewise, John Ortiz being carried off by tiny vicious birds and having his arm torn off in silhouette against an orange sunset is both horrifying (well, it would be more so if Ortiz wasn’t as profoundly irritating as he always is) and audaciously witty. And then there’s Goodman’s camera flash, stuck on repeat from the belly of a skullcrusher. Vogt-Roberts refuses to allow his shots or sequences breathe the way Gareth Edwards did with Godzilla, which means that ultimately his set pieces aren’t as well-constructed, but the upside is a pacier picture, and simply a more engaging, likeable one. I remain to be convinced that Legendary can come up with the goods for their MonsterVerse, however, and it’s difficult to see Kong vs Godzilla playing out any differently to Batman V Superman, just with less human interest (if that’s possible), but I’m all aboard for whatever Vogt-Roberts chooses next. Hopefully it will allow him to exercise that funny bone, and if it doesn’t, perhaps he should go back to making something smaller and more personal.